Lately I’ve become very anti-hip and anti-novelty with my practice materials, and the 40-page Studio Funk Drumming by Burns and Farris has that in spades. 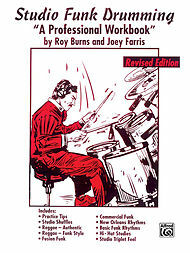 Written in 1981, and revised in 1994, this book focuses on functional grooves in the style of the 70’s and 80’s, before the ghost note explosion that followed the massive sampling/rip-off of Clyde Stubblefield, and before David Garibaldi’s busier style became dominant (particularly among students and hobbyists). Think instead Jim Keltner or Rick Marotta. Jeff Porcaro. Doing last weekend’s Roberto Silva transcription also reminded me of this book. The first twelve pages of “commercial funk” exercises are dedicated to a system of backbeat grooves, laying common hi-hat variations (with optional openings) over 36 different bass drum parts, with nothing but 2 and 4 on the snare drum. Mastering this section up to a professional standard, in the range of tempos given, is a nice achievable goal, and will certainly give you a lot of space to think about one of the two or three most important things about your playing: the quality of your backbeats. Once learned, I’ve found it useful for preparing to record, or for fixing tempos that aren’t quite comfortable for me. I play the entire thing without stopping, at the tempo in question, four measures of each groove. Things begin to sit nicely after doing that once or twice. There are good short sections of shuffle and “studio triplet” feels, which don’t cover a massive number of grooves, but do give a good foundation for those styles. There are several pages that are basically obsolete, which I do not use; like the two pages of “funk sambas”. The two pages of “fusion funk” introduce but do not develop a variety of more classically “fusiony” ideas, and can be safely ignored. The New Orleans and Reggae sections are usable, with caution- you want to supplement them with a lot of listening. Which is actually true of any book. The sub-title “a professional workbook” is apt. This book keeps you very focused on time feels you want to have mastered to a very high level of proficiency, and which you can and will actually use in the field. As a funk drummer, your art is in how well you do these sorts of foundational grooves.